New meal planning technology by Healthy Kids Inc. integrates cooking and gardening into one easy platform for healthy eating so that families can eat real food, real easy from seed to table. Healthy Kids Inc. (HKI), the top online meal planning tool specifically geared towards custom plans for families, has launched the first seed-to-table meal planner in the country to help Americans plan, cook, and grow real food using one integrated technology platform. The Healthy Kids Inc. online meal planner was created to solve the two biggest challenges families have with healthy eating – time and money. Using HKI’s proprietary online meal planning platform, a family can now create their own unique meal plan in a matter of minutes by selecting from hundreds of healthy meals and dragging the recipe directly to their calendar, which also populates a weekly shopping list. “Meal planning is proven to help families save money, boost healthy food intake, all while reducing the consumption of fast foods and processed foods,” Curry said. The meal planner takes it a step further by also pairing each dinner recipe with a Professional Chef’s cooking video, now paving the way for even kids to help out in the kitchen by simply cooking along with the chef each evening. 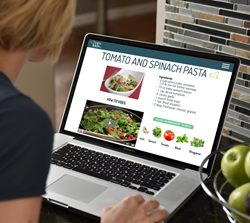 To help families that want to eat fresh foods with the highest nutrients and least expense, the meal planning technology now includes a fully integrated garden platform. Families are now guided through each step of growing the foods featured in their favorite recipes. Since piloting their garden technology a year ago, they have helped nearly 10,000 vegetable plants get started in containers throughout the U.S. Families cite cost as the most important factor when shopping for fruits and vegetables. Using the Healthy Kids Inc. meal planner to grow fresh vegetables, families can save up to 25% on their grocery bill, while significantly increasing vegetable consumption. Healthy Kids Inc. were the recent winners of the 2015 Small Business Administration’s local InnovateHER competition hosted by the Robert C. Byrd Institute for Advanced Flexible Manufacturing (RCBI) and the 2016 Vanguard Agriculture Competition sponsored by RCBI.